You’re going to be hearing a lot from the Australian Medical Association about That Homebirth Study In South Australia, so here are a few actual facts to be getting along with in the meantime. Note that the Medical Journal of Australia is the journal of the AMA, not an independent publication. The study also found that low Apgar scores were more frequent among planned home births, and use of specialised neonatal care, as well as rates of postpartum haemorrhage and severe perineal tears, were lower among planned home births, but these differences were not statistically significant. 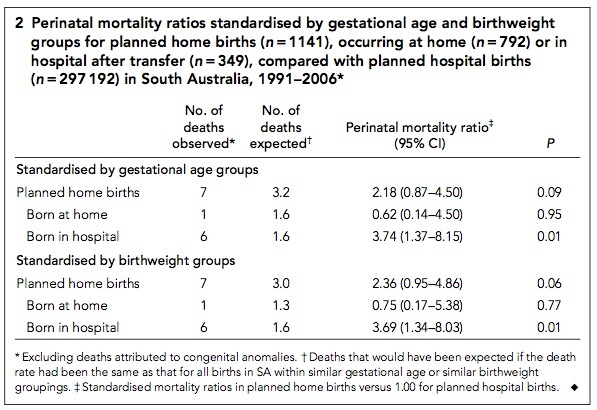 The study was a retrospective population-based review of births in South Australia over a 16-year period. There were 297192 planned hospital births in that time, and 1141 planned home births, 782 of which occurred at home. There was no difference in Apgar scores or neonatal intensive care unit admissions or postpartum haemorrhage. Everyone agrees on that, though the AMA has worded their press release ambiguously, presumably to try to slip some extra spin past to the keeper. Intervention rates – Caesarean section, instrumental delivery, episiotomy – were substantially higher in the planned hospital birth group. C section rates were tripled, even when adjusted for maternal age, parity, occupation, smoking, plurality, medical and obstetric complications, gestational age, size for gestational age, congenital anomalies, and rurality. The adjusted instrumental delivery rate was also tripled in the planned hospital birth group. Episiotomy was seven times as likely with a planned hospital birth , even once risk factors were corrected for. 21.7% of women planning hospital births underwent episiotomy; 3.6% of those planning homebirth underwent episiotomy – and the vast majority of those operations occurred in hospital after transfer, with only 0.4% of women actually birthing at home being cut open. Rates of third and fourth degree perineal tears were the same (higher on paper in the planned hospital birth group, but the difference was not statistically significant); this massive increase in hospital episiotomies prevented no tears. 2. One stillborn, “fresh” stillbirth, time and cause of fetal death unknown. 9. A “seriously” post-term birth, mother deferred referral; eventual stillbirth in hospital. There was no such scrutiny of the 2440 perinatal deaths in the planned hospital birth group, except to say that 87 of them were attributed to intrapartum asphyxia (lack of oxygen supply to the fetus in labour). Of the three deaths attributed to intrapartum asphyxia in the planned home birth group, two occurred in hospital. One at home. One. So there are your big giant scary homebirth deaths. There is your “sevenfold higher risk of intrapartum death” and your “27-fold higher risk of death due to intrapartum asphyxia”. There are the data being presented in support of the legal restriction of reproductive choice. There is the death Pesce is hanging his hat on as AMA-sponsored proof that midwives are dangerous and need to be controlled by obstetricians. One asphyxia-attributed death in the course of an actual home birth, with cause and timing and preventability unknown. One. In sixteen years. Yeah. I think we got that. Important Note: If this study had shown a substantial increase in fetal deaths with home birth, this would still not be a reason to place legal restrictions on reproductive choice. It would not be a reason to imprison women in hospital by State force, and it would not be a reason to stop women from making informed decisions about our own bodies. They are our bodies, and until a fetus is born, we get the final say in what happens to us. So the total rate of death for planned home births is statistically indistinguishable from the rate for planned hospital births but the rate for a particular cause of death is statistically significantly higher for planned home births. Therefore, the rate for other unspecified causes of deaths must be higher for planned hospital births, which means that the same data and methodology, but picking a different cause of death, would show that hospitals were really risky (for that cause). 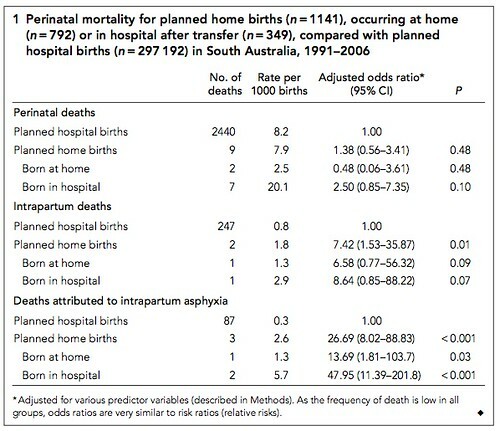 I think the extrapolation from “1 death” to “greater risk for that cause of death” is statistically sound, though – the 95% confidence interval stretches from 1.81 to 103.7 – it’s not possible to say with any certainty at all how much riskier giving birth at home is, but it is possible to say that, were it equally risky, it would be very unlikely that there would have been any deaths at all. Of course, highlighting this particular cause when the all-cause death rate is essentially identical gives a very misleading impression. I disagree. With such small numbers, the idea of applying statistical methods is nonsense. The premise of all statistical methods is that you have large samples, large enough to swamp out the noise. In this case, you have a sample of 1. In order to come up with a meaningful number for the actual risk, you’d have to have, say, 100. I mean, even the numbers themselves indicate that they should at the very least be taken with many grains of salt. Look at that range: “1.81 to 103.7″. [*] That’s really saying that they don’t even know the order of magnitude of the “true” risk ratio. It’s saying that it is probably not as big as 1000. The lower number is statistically meaningless, but since there was one death, you know the risk isn’t zero. That’s all you know. The people who wrote the article obviously don’t have a clue about statistics (or they chose to ignore it), they just plugged the data into a statistics program and blindly copied the output into the article, spurious precision and all. After all, the computer never lies, right? [*] Imagine if someone told you that a tree’s height was “between 1.81 to 103.7 feet.” How seriously would you take the “1.81”? Or the 3.7? Thank you for this brilliant piece. Now if only we could convince journalists that reading past the synopsis and the press release might be worth their time. Thank you for this piece. I feel so very tired and exasperated at the medical establishment’s propaganda campaign against homebirth and the fact that so many people seem blissfully content to let it all happen. Thank you again. The sample size for planed homebirths that occurred at home isn’t 1, it’s 792. However the number of events within that sample group is 1. The distinction is important because the analysis isn’t done on the number of events, it’s done on the odds/risk which are calculations from the sample based on the contrast between events and non-events. A small number of events, as seen here, doesn’t create a problem for noise (which is dealt with in ways beyond pure size of study – “large enough” is certainly more appropriate than “the bigger the better”), though it will render certain methods of data collection and analysis more appropriate than others. I mean, even the numbers themselves indicate that they should at the very least be taken with many grains of salt. Look at that range: “1.81 to 103.7?. [*] That’s really saying that they don’t even know the order of magnitude of the “true” risk ratio. I saw an article in the Terror today which seemed to indicate that a hospital had sent police to the house of a woman who had refused a hospital induction whilst also under the care of a private midwife and intending to have a home birth. I didn’t read it in detail (it’s the Terror after all, who knows whether there’s any truth in it anywhere?) but I frankly don’t care if she was bungy jumping, no-one gets to over-ride her decisions about that baby until it’s born. There has to be a line in the sand at which the interests of the baby are allowed to be considered independently of the mother’s, and I can’t imagine any line other than when the baby is, in fact, independent of the mother by means of birth. In terms of this study, the 1 isn’t enough to convince me. Yes, it’s outside the 95% confidence interval, but stats on the whole is not good with outliers. This one may or may not be an outlier, but there’s nothing in the data to say either way. Physical sciences “untainted” with free will throw up outliers. So I agree that the sample size of the event doesn’t generally matter, but I can tell you that I’m not going to be convinced by one Higgs Boson (which will, if it is found, be found by looking for events in sample sizes of gazillions). Such blatant hatred,,,, or maybe FEAR is the real feeling that the doctors have for the midwives. The state of mind that accepts birth and respects women can’t be held in the same mind that holds fear of birth and women. I wish they would stop their fear campaign and sign on to real caring. They might actually become fulfilled and happy in their work. However, babies were seven times more likely to die from complications during a homebirth than a planned hospital delivery. This isn’t just twisted statistics and poor interpretation; it is outright untrue. I’m also trying to grasp the idea of confidence levels. The confidence intervals of 1.53-38.57 for the sevenfold risk and 8.02-88.83 for the 27-fold risk seem remarkably large. “Infants born after transfer to hospital were three times more likely to have an Apgar score of < 7 at 5 minutes than infants from planned hospital births"
Presumably infants born after transfer to hospital are going to be in the highest category of risk for low Apgar scores. If they looked like they were going to be fine, they wouldn’t be transferred to hospital, and if they looked like they were going to have problems they would be transferred, and so lower Apgar scores would be far more likely. I posted a reply on my blog to this. 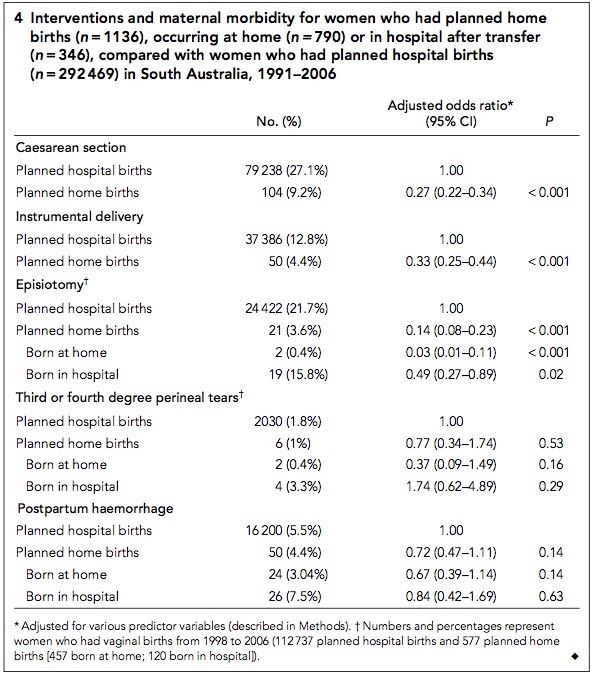 .-= Emma Someone´s last blog ..Planned home and hospital births in South Australia, 1991–2006: differences in outcomes =-. David: Yes, it makes no sense to try to prove any sort of point about anything with the post-transfer Apgar scores. There is no data on a group of planned hospital births in which major complications occurred, so there’s no appropriate comparison group. You need to also take a closer look at those “three intrapartum asphyxia” deaths in the ‘planned home birth’ group. Two occurred in hospital. And we also need to take a close look at why two of the women in the study chose to delay transfer to hospital; how about a root cause analysis involving previous horrendous experiences in hospital? Either way, “Midwives are dangerous!” is not the message. The homebirth have been closely scrutinised. How about let’s apply the same scrutiny to the hospital births, if we’re serious about saving lives? There are far far more deaths in hospital; if intrapartum asphyxia is preventable, as the AMA seems to be saying, then adjustments to care there has the potential to save many more – 87, in this sample. 87 intrapartum asphyxia deaths in hospital. Why is the media producing conspicuous grief and concern over one baby dying at home, and ignoring the 87 intrapartum asphyxias in hospital? Why are they not questioning the massive increase in surgery and injury that occurs in hospital for no improvement in perinatal death rate? There is a take-home message from this study, and it’s exactly the same as for the recent Canadian study. The medical profession likes to scream about dead babies and bleeding mothers in its ongoing fight against losing “control” of birth. This home birth group was not a carefully selected low risk group – it included women with twins, previous C sections, post-term pregnancies, fetuses with known lethal anomalies and so on. Yet, the perinatal mortality and postpartum haemorrhage rates in the planned homebirth and planned hospital birth groups were exactly the same. The homebirth group achieved this superbly low perinatal mortality with far fewer operations and half the neonatal intensive care. If past studies can be drawn on, this means they likely also achieved this superbly low perinatal mortality – the same perinatal mortality that the AMA crows about as being among the ‘best in the world’ – at low costs and with greater satisfaction of the people involved. But you won’t see that in the papers. Thank you very much for posting very informative, however it still dosent asnwer the question as to why the AMA is trying to force hospital confinement upon pregnant women, whilst the rest of the population still has the basic civil, legal right to refuse treament. Why is it i can refuse chemo if i have cancer, but i am required by law to birth my baby in a clinical frightening environment where i am at the very least ten times more likely to pressured into unecessary medical procedures. This law is a blatant abuse of the rights of women to their own bodies, whats next, abortion becomes outlawed and the fetus is given legal rights so that every woman who aborts is accused of murder. Is this just a case of an overcontrolling medical assosiation and a religiously biased government body? It certainly makes me wonder? I think the statistical concept that is relevant to this discussion is power and effect size. A study has to have an adequate number of subjects to have adequate power and adequate effect size. The smaller the difference you are looking at, (say, one in more than 1000), the larger the N necessary. Don’t get me wrong, I’m 100% against these laws – midwifery should be the standard of care. But what the laws do is essentially outlaw homebirth midwifery – they do *not* force women to birth in a clinic, nor do they mean you can’t refuse treatment. The laws do not outlaw unassisted homebirth. Seems pretty poor evidence – I’m far from a methodological purist, but if ever there was a need for an RCT to establish safety, this was it. There are so many potential confounding variables and differences between the home and hospital groups that any comparison is highly suspect (even if obvious risk factors are adjusted for). 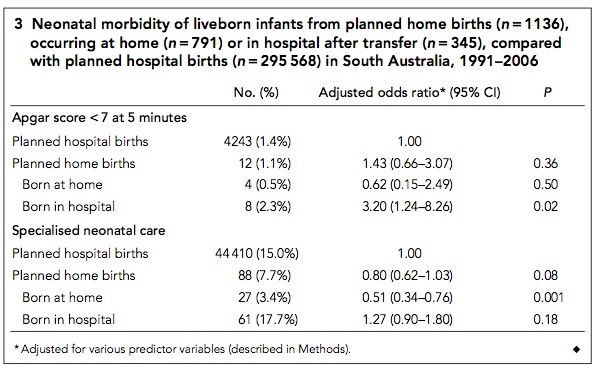 There are longstanding calls for an RCT of home v hospital birth (e.g. http://www.ncbi.nlm.nih.gov/pmc/articles/PMC2350434/), but recruitment tends to be problematic, because of resistance to randomisation (e.g. http://www3.interscience.wiley.com/journal/122206818/abstract). The AMA trots out another media bonanza piece of crap » Janet Fraser - Where birth and feminism intersect.